Built in 1860 to serve a district of of densely packed housing in Ladywood, St Barnabas was demolished with the slum clearances one hundred years later. Image courtesy of Mac Joseph - see his website Ladywood Past & Present - . Contact him for reuse of this image. This church appears on the 1890 Ordnance Survey map which can be viewed at British History Online - http://www.british-history.ac.uk/mapsheet.aspx?compid=55193&sheetid=10089&ox=3673&oy=2395&zm=1&czm=1&x=353&y=196. Although Ryland Street had been laid out by the mid-1830s, Ladywood lay on the edge of the built-up area of the town with allotments gardens and fields beyond. Within 20 years, however, the area had rapidly been built up with industry, long rows of cramped terraced houses and courts of back-to-backs filling every available space. St Barnabas' Church was built to serve this poor working-class area in Ladywood; many of the houses here were back-tobacks. With a parish assigned to it out of that of St Martin's, this was a small stone church in Decorated Gothic style designed by William Bourne of Dudley, an architect who had previously built Commissioners' churches in the Black Country. The land was the gift of the benefactress Louisa Ryland after whom the street is named. This simple rectangular church was oriented south-west-north-east with an apsidal chancel to the south-west and a north-east turret onto the street. It was consecrated in 1860 with a parish assigned the following year. The parish was enlarged in 1901 partly including the parish of Christ Church, New Street which had closed four years earlier. 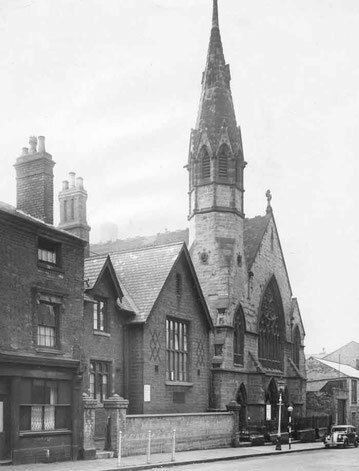 St Barnabas' CE School stood alongside the church in Ryland Street. Both school and church were closed c1966 and demolished as part of the extensive redevelopment of Ladywood. The district is now part of the parish of St John the Evangelist & St Peter, Ladywood. For images of old Ladywood, inlcuding Ryland Street and St Barnabas' church and school, see Mac Joseph's Ladywood Past & Present website - http://www.oldladywood.co.uk/rylandstreet.htm.